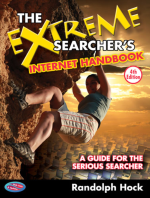 "The Extreme Searcher,s Internet Handbook is the essential guide for anyone who uses the Internet for researchers,librarians, teachers, students, writers, business professionals, and others who need to search the Web proficiently. In this fully updated second edition, award-winning writer and Internet trainer Ran Hock covers strategies and tools (including search engines, directories, and portals) for all major areas of Internet content. Readers with little to moderate searching experience will appreciate Hock's helpful, easy-to-follow advice, while experienced searchers will discover a wealth of new ideas, techniques, and resources. Anyone who teaches the Internet will find this book indispensable.."
fourth edition of The Extreme Searcher's Internet Handbook. Whether headed to Beijing on business, Cancun on a cruise, or to Hawaii to learn to hula, using the Internet can probably make your trip less expensive, more productive, and more fun. The trick is to know where and how to look, and sometimes just what to look for. Scores of millions of people have taken advantage of airfare and other savings they have found by shopping around on travel sites. Fewer, though, have used the Internet to investigate details of their destinations and what other people are saying about those destinations, to plan the details of their route before they get there, to check the weather, to learn the few words necessary to be "polite" in a foreign country, and generally take greater advantage of the wealth of travel resources that are out there. To go to the page containing links to all of the websites covered in the book, click here. Ran also writes a monthly column for the CyberSkeptic's Guide to Internet Research. Click here to check out some of the columns. The author welcomes comments . Could people in your organization be using the Internet more efficiently and effectively? If so, contact the author of the Extreme Searcher series, Ran Hock. Through his company, Online Strategies, he provides customized onsite seminars to help people make better use of Internet resources. Click here for more information. "With its many and diverse features, it’s not easy for any individual to keep up with all that Yahoo! has to offer. Fortunately, Randolph (Ran) Hock—“The Extreme Searcher”— has created a reader-friendly guide to his favorite Yahoo! tools for online research, communication, investment, e-commerce, and a range of other useful activities. In Yahoo! to the Max, Ran provides background, content knowledge, techniques, and tips designed to help Web users take advantage of many of Yahoo!’s most valuable offerings —from its portal features, to Yahoo! Groups, to unique tools some users have yet to discover."